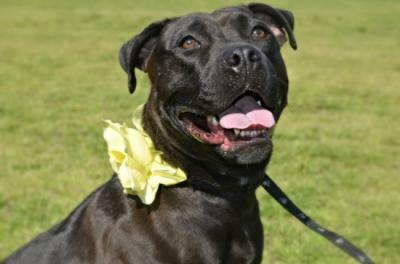 Life threw sweet three year old Am Staff Haylee a curve ball when the apartment complex her family lived in changed the rules and they had to take her to the shelter. Life threw her a better pitch when she found herself in a terrific foster home. Her foster mom says that Haylee is crate and house trained as long as you keep her on a schedule. She walks well on a leash with the right walking harness. This super treat-motivated girl has also learned SIT, DOWN, and STAY! 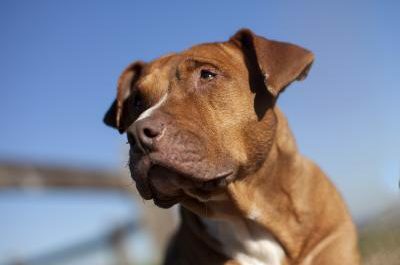 Her foster mom also says she is good with children so she may be the perfect family dog you are looking for. She’s doing well with her canine foster brother and sisters, but may do best in a home with a polite and playful male pal for me to become BFF with! She will also need a cat-free home.